It is used to skin that looks younger, smoother and overall firmer. It is used to skin that looks younger, smoother and overall firmer. UPC: 075609601439 - Olay Age Defying Anti-Wrinkle Replenishing Night Cream - 2 Oz, 3 Pack - It is used to skin that looks younger, smoother and overall firmer. - MANUFACTURER: PROCTER & GAMBLE CONSUMER. Olay Age Defying Anti-Wrinkle Replenishing Night Cream is Renews skin's appearance at night when it needs it most while visibly reducing the appearance of fine lines and wrinkles - awake to skin that looks younger, smoother and overall firmer. Olay Anti-Wrinkle Replenishing Night Cream, with Pro-Retinol and Beta-Hydroxy, is a wrinkle fighting formula that works deep within the skin's surface to significantly reduce the appearance of fine lines and wrinkles. 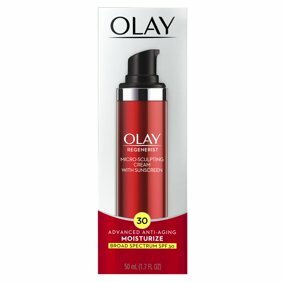 Olay intense moisture with Vitamin E replenishes skin without added oil - leaving skin soft and smooth. Water, Glycerin, Isohexadecane, Niacinamide, Dimethicone, Isopropyl Isostearate, Polyacrylamide, Titanium Dioxide, Panthenol, Tocopheryl Acetate, Retinyl Propionate, Ascorbic Acid, Stearyl Alcohol, C13-C14 Isoparaffin, Laureth-7, Cetyl Alcohol, Polythylene, Aluminum Starch Octenylsuccinate, Behenyl Alcohol, Benzyl Alcohol, Cetearyl Glucoside, Cetearyl Alcohol, Ethylparaben, Stearic Acid, PEG-100 Stearate, Propylparaben, Disodium EDTA, Fragrance. Smooth over cleansed face and neck each night to awake to younger, firmer looking skin. California�_Ts Proposition 65 Warning: May This item contains chemicals known to cause cancer, birth defects, or other reproductive harm. Reference by California Office of Environmental Health Hazard Assessment (OEHHA) at: www.oehha.ca.gov/prop65/prop65_list/Newlist.html. Instructions: Smooth over cleansed face and neck each night to awake to younger, firmer looking skin.